After various failed attempts at different designs, none of which I was happy with, I finally came up with this which will do until I have the strength to change them again! I adored Lecente's Irregular Shapes which that sadly they don't do anymore but totally should. I only like to use a few of them in Shellac as I find that the chunkiness of them will make the nail too uneven otherwise but of course they're perfect in enhancements. 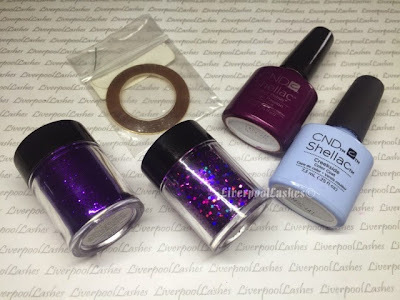 I wanted to make sure I definitely used them in this designs so then matched up CND Shellac in Tango Passion and Creekside with it alongside Lecente Purple glitter. To create the middle nail I wanted to make sure I didn't just cover the entire nail so to ensure the blue shows through, so I wrapped a piece of striping tape around my finger and focussed on applied glitter to every other stripe in not a precise me this which gave me this effect. If you can see, I also applied three little irregular shapes to the Tango Passion nails to tie the look together. 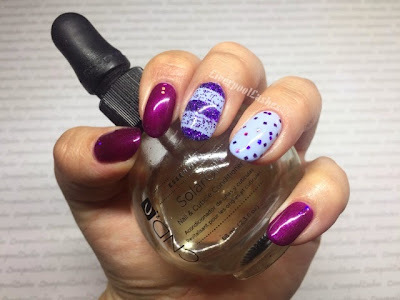 I am fairly happy with what I did but I'm not utterly blown away by them, truly be known but it still may give you some inspiration for your nails!